This is a new board designed by Bruce Wylie and made by Cobra, as an upgrade to the Original Windsurfer, and made so it can be branded by other companies, Starboard and Exocet have already done this and Naish should bring theirs to market soon. - Simple - no footstraps, sliding masttrack etc. I like the look of it too. Just checked with the local retailer in New Zealand and he says the RRP is 2400, although I can get 20% off that for pre order which is the same for say, a Kona or Go. It looks like the Australian distributor is retailing a complete board and rig for 1899! I think the design criteria was more about triangle course racing, and therefore the planing aspect is not in focus, and really shouldn't as this is also about getting people on the water in lighter winds and I just judged the planing ability by wathcing the video from the Windsurfer Worlds. Personally I would use it for 3 bft and below and primarily for hotdoggin', teaching and cruising around, so there would hardly be a need for a strap - you could install one yourself though - IMHO I think it is one of the charms, sailing without straps. I do like the simplicity and light weight - a light wind "do-it-all" kind of board, but yes, a windSUP is close to the same - often minus the daggerboard. I pulled the trigger and have pre ordered one. 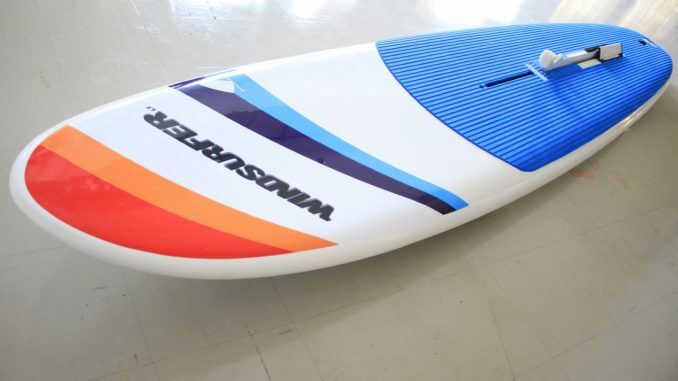 I'm just not happy enough with the Starboard Windsup 12'2 freeride. Should arrive December for our summer. I like the looks of it. Getting back to easy-to-use funboard. Hopefully a little lighter, easier and a touch more stable for newbies. Needs to be colorful, easy to set up, and (comparatively) easy to learn to ride. Will be curious to find out how well it surf sails (without centerboard). board is really nice for light wind. No straps were INTENTIONAL. This is not a short board and you don't need straps when sailing a displacement board. Board is well built and they did a great job on the board. Not so thrilled with the rig and sail however. 30 year old style "mylar" sail, which will fall apart. Not cheap, but fair price for what you get. This board checks off one big problem off the sport, but there are a few others it does not address like PRICE. Yeah, I watched the videos of the race events...the sail looked old-school unstable. I understand the simple, no battens for weight idea, but it seems that the board is the best of the 80s and sail one of the worst. If need for really light, why not something like a 'SF-KS3'? A 3 batten Freak. That would be light, very forgiving and even more colorful than what they're selling. Even a regular Freak would be good. That, or I've never sailed one of the Summer Freaks (is that that sail is called?). Several of the longboard users on the forum like the Summer Freak as an old-school replacement sail. The Summer Freak is surely better than what they're shipping. Really seems like Cobra missed the mark on the sail. I guess they didn't want to force racers to upgrade their entire kit by not updating the sail. I read that existing WOD sailors in Australia were offered the board for 750 as a trade up, and 1999 for full rig. I have had to pay RRP 2400, [ less 25% discount for prepay ], so 1800, which is decent but 2400 off ther shelf is about the same for a SB Go or similar. I have 6.3 / 8.0 / 9.0 SFUL but if I may look at a summerfreak. The spec weight is 15kg, so a lot lighter than the original. 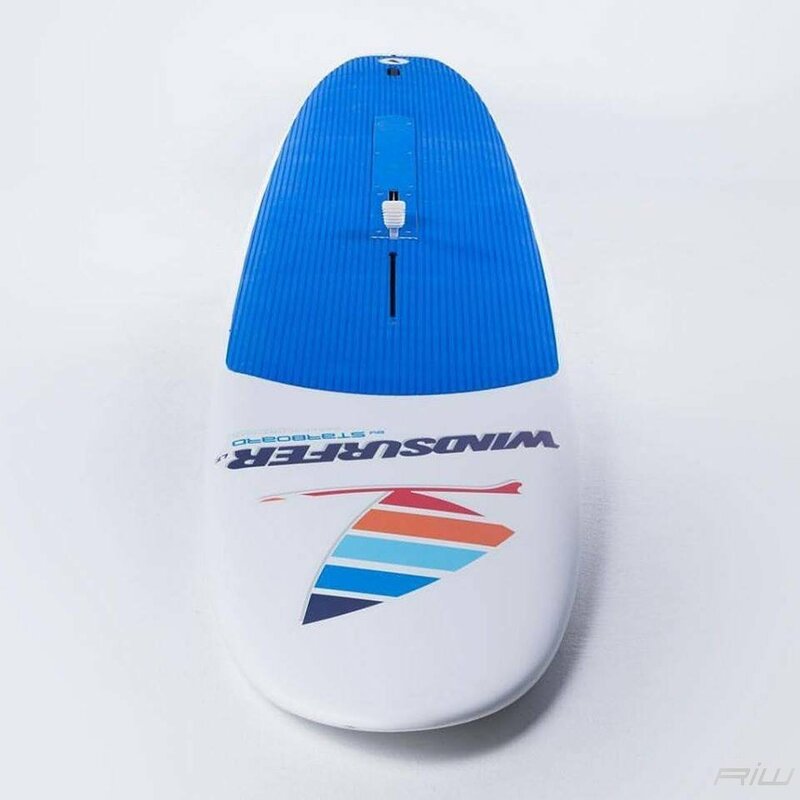 It has the tool-less fin bolt like the old mistrals so quick and easy to set up, and unlike the KonaOne, the centerboard plates have curved tracks from top down to the pivot point, so the centerboard can easily be removed without removing the side plates, ( for the racing centerboard version ). The school centerboard is narrower and has a separate pair of pivot holes in the side plates and can fit under a deck cover plate to provide a flush deck. The one in the photos above has the school centerboard. The grip tread is harder than regular EVA it seems and the ribs are deeper, so barefoot or booties, I have not had any issues with slipping, even when fully planing on the 6.5 Summerfreak. The white paint on the deck is slippery gloss, and there is no nose recess or hole up front so holding the nose if you want to trolley it to the water is difficult. Yes, the sail was the first thing to improve on those old style boards !! 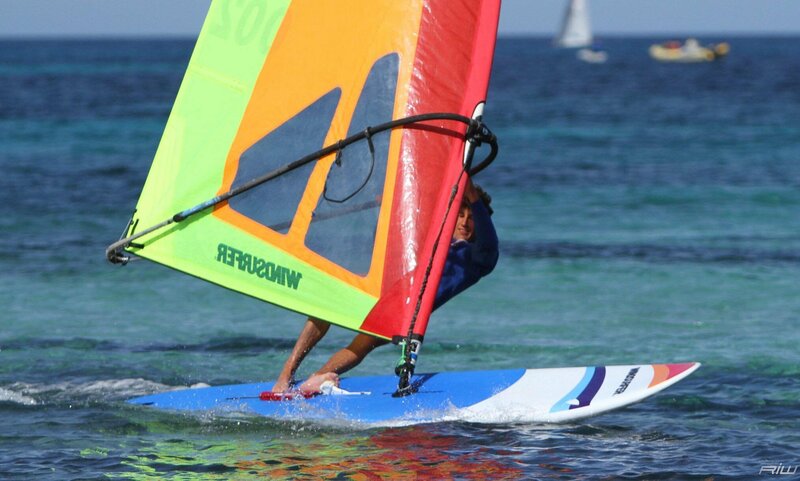 I started with a BIC Dufour Wing and I will NEVER forget how much better that board ran with a sail change. Man, that board looks narrower than I remember! If you want that bottom batten to rotate in really light wind, ease the tension 1/2 a turn or so. Love how that board just drives upwind- good old days!